POLITICAL TIDBITS: I had this strong déjà vu feeling in Phnom Penh as I listened to claims of election irregularities and to Sam Rainsy’s plea for US support for vote recount. US State Dept. sympathetic and insists on credible elections. Rainsy luckier than us Filipinos: we have documented all kinds of issues vs. Comelec but Chair Brillantes simply stonewalls them---and no reaction from US. I had this strong déjà vu feeling in Phnom Penh as I listened to claims of election irregularities and to Sam Rainsy’s plea for US support for vote recount. US State Dept. sympathetic and insists on credible elections. Rainsy luckier than us Filipinos: we have documented all kinds of issues vs. Comelec but Chair Brillantes simply stonewalls them---and no reaction from US. Phnom Penh, Cambodia---When I got the invitation from former Speaker Jose de Venecia to join two distinguished groups of international observers to the parliamentary elections in Cambodia last Sunday, I grabbed the chance as I thought it would be a vacation of sorts, a welcome relief from all the lousy news in Manila---the pork barrel scam involving Congress, allegations about presidential sister Ballsy Cruz and husband Eldon’s involvement in the Czech firm Inekon mess, the ‘three kings’ operating in Customs, and of course, the continuing unresolved controversies over cheatings in our May 13, 2013 automated elections, etc. But lo and behold, it only brought me this déjà vu feeling---like I never left home. In Phnom Penh, monitors picked up issues of not-so-indelible ink in some places and violence in some areas. In a country of 9 million voters, the opposition claims 1.2 to 1.3 million were unable to vote because their names were not on the list, while about 1 million ghost names were on the voters' list. Yours truly in blue monitor's uniform chatting with Buddhist monks outside a pagoda polling place. 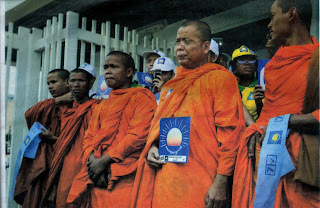 Rumors of impending cheating in various provinces by the ruling Cambodian People's Party (CPP) had prompted saffron-robed Buddhist monks to momentarily abandon their nirvana world and campaign for the opposition coalition of returning exile Sam Rainsy (who, ironically, wasn’t even a candidate in the elections). On election morning our monitoring team came upon a group of monks patiently sitting outside a precinct in a pagoda, armed with cell phones and ready to report to the National Election Committee (NEC) if they spotted fraud. Before the elections our observers’ group had an audience with the ascetic-looking intellectual leader and former Finance Minister Rainsy, who had hinted of the extreme scenario of people power should his people be cheated by the CPP of Prime Minister Hun Sen. With the circumstances of his return from four years of exile in France and persuasive manner of talking, Rainsy reminded me a lot of Ninoy Aquino. during our international monitoring team's dialogue with him. Amidst crowds vying for his attention I managed to get close enough to whisper to Rainsy, “Sure, the way things are, people power could crop up as a decided option for your party, but please don’t die as your people need you,” and he smiled. I thought I detected the same inevitable sense of destiny in him. To add to this sense of déjà vu, guess who was in Phnom Penh to join his counterparts from the nine other ASEAN countries as guests of the NEC?--- Comelec Chair Sixto Brillantes. But he had to rush back to Manila to supervise the coming barangay elections, so mercifully our paths didn’t cross. Three days after Cambodia’s elections things remain far from settled and tension continues to lurk in the capital. A young Cambodian studying to be a lawyer opined that if anything would break out, it will have to be in the capital, not in the provinces. Analysts talk endlessly in coffee shops and in media about what lies ahead for this once strife-torn nation. For this blogger, a veteran of elections here and abroad for 30 years, it's clear that the broad masses of Cambodians clamor not just for reforms but for change of the dramatis personae. The CPP has become a party of mostly old politicians who had stayed too long on the stage (when Ambassador Cunanan and I left 15 years ago they were already the ruling elite, led by PM Hun Sen who has ruled for the past 28 years). Moreover, their fabled lifestyle has shocked the very poor comprising the overwhelming majority. As a foreign observer put it, politicians should know when their time is up. If these claims of Rainsy are vaidated, this means CNRP now has control of the National Assembly and should get to elect the PM who would rule the country in the next five years. Interestingly, since the close of the elections, Hun Sen has not appeared publicly and rumor swept the capital that he has fled the country. The CPP denied it fast as psy-war tactic; nonetheless it appears to have been shaken to its roots by the stunning doubling of victory by CNRP despite Rainsy’s non-run (it was his deputy Kim Sokha who led the candidates) and the CPP’s own loss of 22 seats that it had handily won in 2008. But even more shocking, eight of the young, foreign-educated scions of ruling elite families, whom their aging fathers had placed in middle government positions in the hope that they would continue the dynastic leadership of the country after them, all lost in the elections. It's another deja vu for me---the dynasty issue is alive, but beginning to crumble in Cambodia. Sam Rainsy’s claim of majority vote was turned down by the NEC dominated by Hun Sen appointees and obviously he's not about to yield power easily. In a press conference yesterday morning Rainsy appealed to the UN and international watchdog organizations to mediate, as he demanded a recount of votes to settle the score between the two rival groups. Again, déjà vu, as visions of our own Comelec Chair flashed before my eyes, demanding that complaining civic groups cough up P200 million for a recount! A recount is not difficult under the Cambodian system as ballots are short and contain only the names of accredited political parties; there were eight accredited parties last Sunday and CPP was no. 4 and CNRP no. 7, voters check only the favored party. It works much like our voting for party-list groups. My group of international monitors, led by former Speaker Joe de Venecia, observed the counting in stiflingly hot classrooms with tiny windows in a big school in the capital, together with various local party representatives. The counting was over in an hour or so, with party reps furnished copies of tabulated scores. This is so unlike our presidential system where ballots are kilometric because they contain the names of candidates for innumerable posts. The parliamentary system makes more sense---manually done and sans the PCOS cheating machines. The problem now is whether Hun Sen’s party, which has monopolized power for the past 28 years, would accede to a recount and possibly, given the stunning closeness of Sunday’s elections, flirt with the real danger of losing control of the National Assembly that elect the country's rulers. On the night of the elections, buoyed up by terrific gains his party had made, Rainsy spoke on TV of "peace and reconciliation" with the ruling party which De Venecia's international monitors lauded heartily as "timely and the need of the hour...a win-win situation for all Cambodians." But last Monday morning, as reports of irregularities from the provinces came in, Rainsy stopped talking of a political honeymoon. Early last Tuesday he and his wife, opposition leader Tioulong Saumura, were seen leaving the residence of US Ambassador William Todd and popular speculation was that he sought the help of the US envoy to get that vote recount. In this regard, I can only envy the Cambodian people, for we Filipinos who had monitored our own national and local elections of last May have grown hoarse presenting all manner of irregularities; yet the US government, represented by Ambassador Harry Thomas, chose to play the role of the traditional monkey in Asian fable---see no evil, hear no evil, speak no evil. Obviously the US ploy is to protect the results as far back as our first fully automated elections of 2010 that, in the light of so many revelations that have since surfaced about the manipulable PCOS machines, have seriously put into question the legitimacy of our top leadership installed then. Why the US role of the traditional monkey? It's all about the issue of basing and geopolitical realities.